Due to changes in the family structure — from the multi-generation family under one roof, to the nucleus family — many adult children are facing challenges in caring for their elderly parents. This challenge increases for non-resident Indian-Americans with parents residing in India. Distance can make it difficult to assess your parent’s needs and get them the care they deserve. 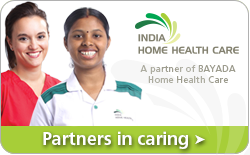 India Home Health Care, a partner of BAYADA Home Health Care is introducing services to assist you in supporting the health and well-being of mom and dad. We understand that nothing is better than being in the comfort of home, surrounded by family and friends. We can be there, when you can’t, to help your aging parents live their best lives at home. There are many reasons to choose home health care, it is an affordable method of care and it keeps our clients safe in the comfort of their own homes. Whether recovering from surgery, living with a chronic condition that may require on-going care, or for assistance with activities of daily living, IHHC can help. We also have a large network of doctors available to support our clients. Our professionals meet the highest quality health care standards because we take extra steps to ensure clinical excellence and safety. Our stringent hiring standards include credential verification and background checks on all applicants. In addition to in-depth interviews, written testing, and hands-on skills assessments, we also evaluate core values of compassion, excellence, and reliability. All of our professionals are supervised by a senior registered nurse who makes regular home visits to ensure the health and safety of your parents. Caregivers are also required to demonstrate their competency annually, with hands-on skills assessments and performance evaluations. Contact us today and learn how your parents can benefit from home health care. An individual's daily habits. ADLs are often used as an assessment tool to determine an individual's ability to function at home, or in a less restricted environment of care. Examples of ADLs include: bathing, dressing, eating, moving around, toileting, and walking. May consist of evaluation, therapeutic exercises, gait training, adaptive equipment recommendations, massage, heat, cold or electrical treatments, all geared toward helping the patient or client attain his/her maximum functional motor potential. (PT) Is needed if a patient has suffered an injury or illness which has affected motor skills or function. Typically, this service is considered skilled care. Services given to help you return to usual activities (such as bathing, preparing meals, and housekeeping) after illness either on an inpatient or outpatient basis. OT is needed if a patient has suffered an injury or illness which has affected perceptual motor skills or the ability to perform activities of daily living (ADL), such as dressing, bathing, toileting, and eating or meal preparation. BAYADA employees who provide care to our clients are referred to as BAYADA caregivers, care professionals, or health care professionals. To distinguish between family caregivers, we include BAYADA in front of the word caregiver when referring to our employees who are providing care to a client.